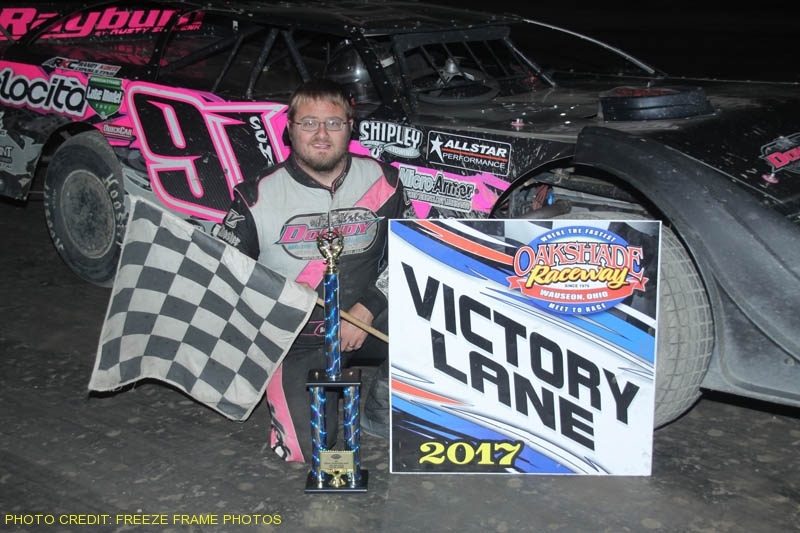 Tight point battles were finally settled on Oakshade Raceway’s Season Championship Night which was highlighted by Devin Shiels earning his first ever Oakshade Raceway UMP Late Model Championship. There were also a lot of kids dressed up in great costumes who came for the candy as well as the great racing for the annual Trick or Treat Night. 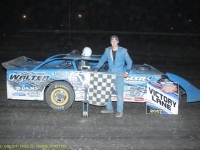 At the start of the Season Championship UMP Late Model feature, Brad Wade seemed to be the car to beat. He was able to fend off a challenge from Brad Eitnear around lap five, but later lost the lead on lap 15 of the 25-lap race to Steve Kester and then brought out the caution flag, forcing him to restart at the rear. As the field reverted to the line up of the last completed green-flag lap, Eitnear would lead the field back to the green flag. As soon as the leaders hit the backstretch, Kester jumped to the outside of Eitnear and McClure, Ohio’s Rusty Schlenk dove to the inside for a three-wide battle for the lead. Kester would take over the lead for a couple laps, but Schlenk would take over for good on lap 17. 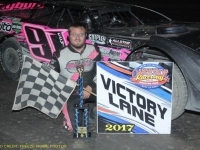 Schlenk went on to post his seventh Oakshade feature win of the year and ended up fourth in the final point standings, one point behind Kester who ended up spinning and finishing outside the top ten in the race. Devin Shiels capped off his championship season with a second place finish. Casey Noonan started deep in the field and ended up getting by defending track champion Brian Ruhlman for third. Eric Spangler got by Hillard Miller late in the race to end up fifth. 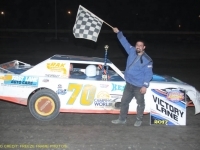 Brian Fisher darted out to a big lead in the UMP Sportsman Season Championship feature event. A caution on lap nine wiped out Fisher’s lead putting point-leader Drew Smith on his rear bumper for the restart. Smith, from Sylvania, Ohio, passed Fisher for the lead on lap 10 and went on to earn his fifth feature win of the season and more importantly the 2017 Sportsman Track Championship. Fisher held on finish second followed closely by Rusty Smith. 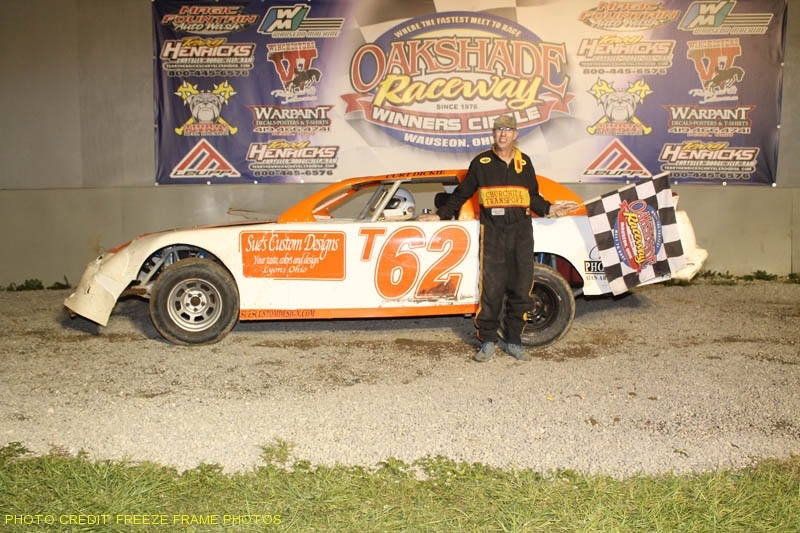 Brandon Gregory finished fourth and the defending Oakshade UMP Sportsman track champion, Mike Jessen, ended up fifth. 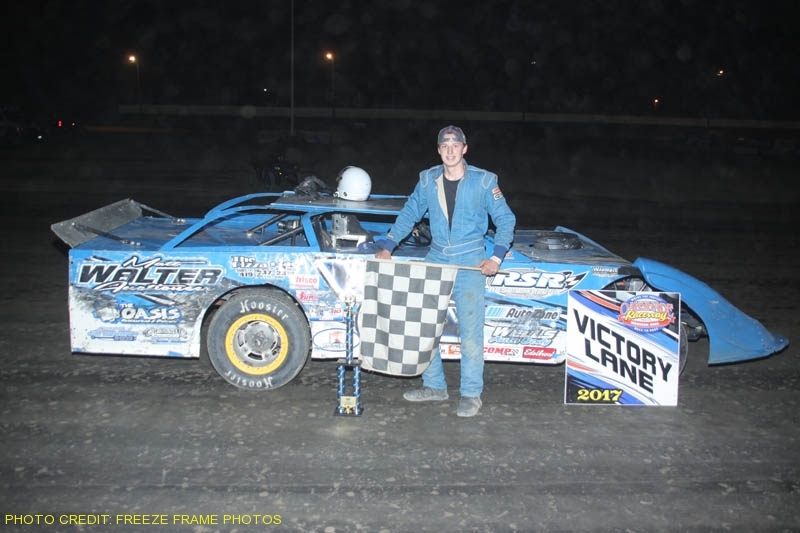 Jeff Foks Jr. from Holland, Ohio, nursed a slim 16-point advantage in the Bomber point standings at the beginning of the night and was able to stay out of trouble to pick up his fourth Bomber A Main win of the season and his fourth Bomber track championship. 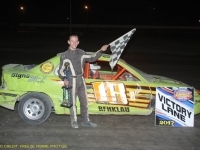 William Cundick started on the pole of the Bomber A Main and led the first lap. Terry Rushlow took over on lap two after a lap one caution. It only took three laps for Foks to reach the front after starting 10th. 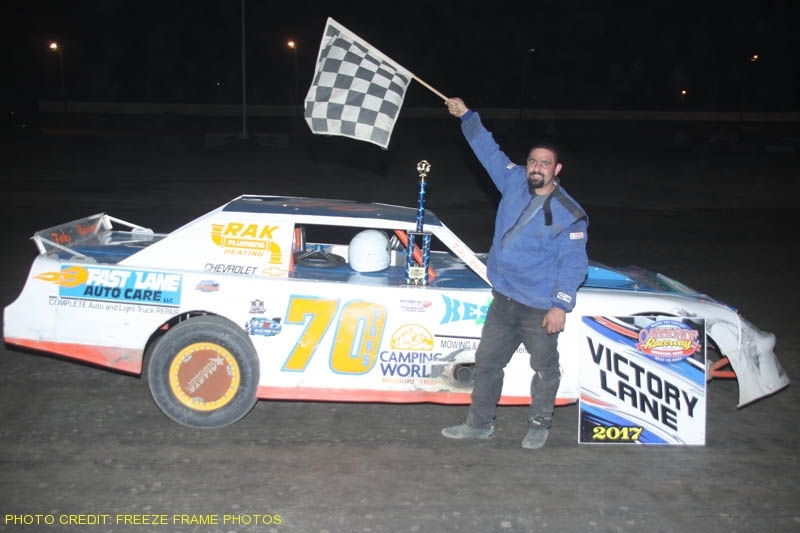 Rushlow held on to finish second and passing the most cars to end up third was last week’s feature winner Craig Dippman. Dippman started 23rd. Donovan Paskan finished fourth and Cundick slipped back to finish fifth. The closest point battle of the night was in the Compacts with Jeff Foks Sr. holding just a six point lead heading in to the night. 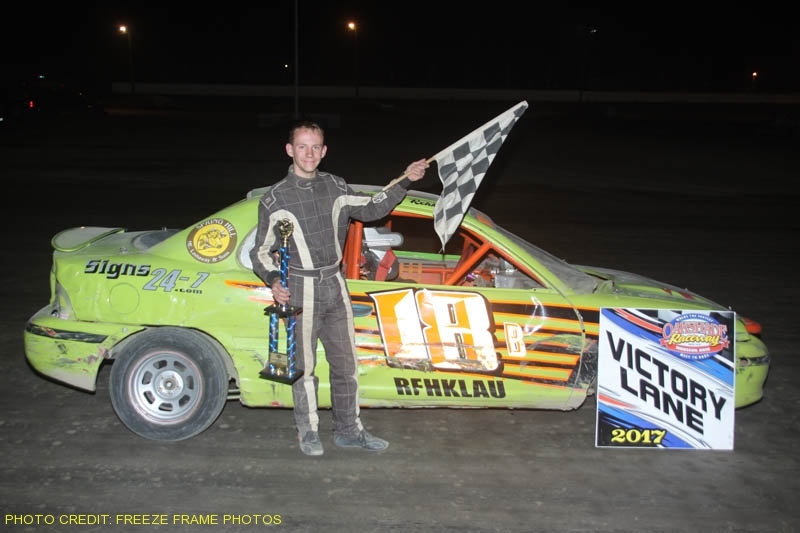 That lead proved not to be enough as Waldron, Michigan’s Brogan Rehklau picked an incredible 12th feature win of the year and finished far enough ahead of Foks to earn his second Compact track championship. Randy Murday finished the race second followed by Jason Deshler, Nathan Goodman and Josh Proffitt. Foks ended up 10th. 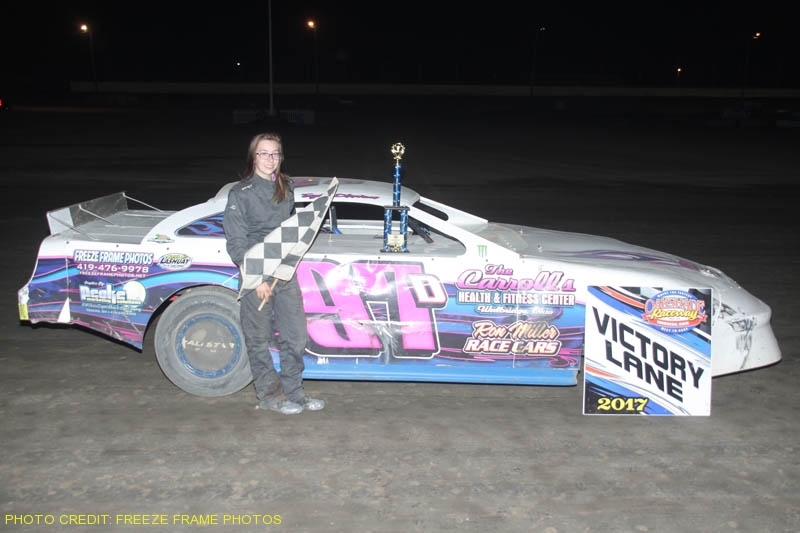 Season Championship Night was capped off by perhaps one of the most exciting races of the evening that had no championship implications. Brandon Clark charged through the field to the front after starting at the tail and put on a heck of a battle with Oregon, Ohio’s Taylor Dippman for the win. Both drivers traded the lead several times in the closing laps. Clark held the lead at the white flag, but Dippman made a nice move coming off turn four on the high side to beat Clark to the finish line. Amy Clair got by Cody Stetten late in the race to end up third and Scott Hammer rounded out the top five finishers. Another great night of late season racing action is on tap for Saturday, September 23rd with the Papa Boiler Bomber Spectacular paying $1,000 to win and the UMP Sportsman Dirty 30 paying $1,200 to win and $125 to start. UMP Late Models and Compact will round out the evening’s racing program with gates opening at 4pm, hot laps at 6pm and racing at 7pm. 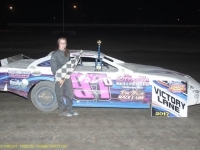 ← Today Is Season Championship/Trick Or Treat Night – Next Week Bomber Spectacular/Sportsman Dirty 30!